Wow! My eyes went from 20/45 to 20/25 (almost perfect) simply with raw plant-based foods! I read this could happen in The Sunfood Diet Success System and it did! It says that digestive residues from cooked foods especially animal meat and dairy get stored in many places in the body including the tiny capillaries in the eyes and a cleansing diet will over time improve eyesight. To be honest I had more serious wellness challenges that also cleared up and this was more like an added bonus to me. I read in The Sunfood Diet Success System that when I eat raw plant-based foods (especially raw fruit) my body first cleans out vital organs (ie: lungs, heart) and later less vital (ie: eyes). I wore “corrective lenses” (eyeglasses) from 1972 to 1989. I started with a minor astigmatism but developed some nearsightedness too over the years while wearing glasses as a high-school and college student and later as an administrative-assistant. I stopped wearing glasses in 1989 after giving birth and becoming a stay at home mom since I had lifelong chronic sinus trouble (cow-milk secondary food allergy) and found glasses uncomfortable on my nose and was a bit squeamish at the thought of putting in contact lenses. I went vegetarian for about a year in 1978, plant-based and vegan(V) in 1990, raw-vegan(RV) in 1999, 80/10/10 high-carb-low-fat raw-vegan(HCLFRV) in 2010, and high-carb-low-fat-vegan(HCLFV)-occasional-cooked-“rawtill4”-vegan in 2016 winter (vegan soups mostly). My annual eye exams showed my eyes went from 20/45* to 20/40 in 2004, to 20/35 in 2005, to 20/30 in 2006, and 20/30 to 20/25 in 2007; so it took several years as raw-vegan to clean out the tiny capillaries in my eyes, but I was happy and amazed with the progress. 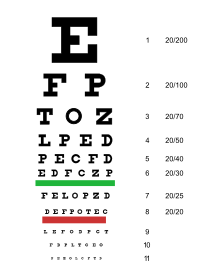 *The first number is the distance in feet you are from the eye chart and the second number is the distance in feet most people can read that line. Btw there’s a formula in The Sunfood Diet Success System that says it takes one month as all raw-foodist for every year as a cooked-foodist to completely cleanse body of digestive residues and mucoid plaque and at some point there is a “great purge”; however while it’s a guideline I think “slow and steady” progress is good and just about any amount of fresh raw fruits and vegetables added to the diet is very helpful, be patient, make sure to get enough fruit/carbohydrate calories, the body is always cleansing itself, and may be best not obsess about cleanliness. At age 55 after after 9 years vegan(V) plus 11 years 100% raw-vegan(RV) plus 6 years 80/10/10 HCLFRV plus 2 years 80/10//10 rawtill4-occasional-cooked(winter soup mostly)-vegan, I noticed occasional “eye-floaters”. More recently I’ve gone back to all HCLFRV and will see if it helps with the “eye-floaters” and how long it takes. If you have any experience with “floaters” please share in a comment. Thank you. Btw, my occasional “eye-floaters” are like two black spots or spiders that kinda move around and are a bit annoying, not to be confused with “aura” flickering lights from migraine headaches. I had chronic migraines from age 14 to 31 until after giving birth, became a stay at home mom, and going plant-based vegan, then raw vegan, and eventually high fruit raw vegan. Btw, I’ve helped relieve or manage with nutrition, lifestyle, and service-dog (rescue/adopted) symptoms including allergies, ADHD, PTSD, depression, anxiety, endometriosis, pre-cancer (calcification), prediabetes (hypoglycemia), and vertigo. This entry was posted in 21-day-cleanse, cleanse, life, natural-wellness, raw, raw food, raw vegan, wellness and tagged clean foods, cleanse, eye-floaters, eyes, eyesight, fruit, glasses, lasik, lasik surgery, migraine, mom, natural-health, natural-wellness, nutrition, plant-based, raw vegan, rawfood, vegan, veggies, vision, vision correction. Bookmark the permalink.